This is the week where the winter break really kicks off for me because I finished all of my grading and can dive all the way into Long John for the better part of a month…until school starts back up again at the end of January. Towards the end of grading, when focus seems to slip and patience wanes, even music wasn’t working for me. RainyMood is a white noise website that just has an endless loop of a rainstorm that will play behind anything else you put in front of it. Want to listen to classical music with the sound of rain peeking through? 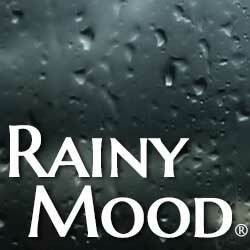 RainyMood.com is your jam. I discovered it years ago and I every time I return to it, it unfailingly calms me down. They have an app version for smart phones; what I wish was that they had an app version for my desktop; though, I guess, that would just be the website. When grading, my mind becomes a highly functional bag of mush. Even when I have an evening to dedicate to reading, or now, right after I’m done grading, if I sit down with a novel or a book that’s just words, I can’t bear to look at it. As my brain heals from the semester, I continue on with the literature that got me through the semester: comic books (i.e., books with words and pictures). X-Men: Grand Design by Ed Piskor. One of the understandable barriers for entry into reading comics is the deep history that a lot of the more popular books have. A potential reader can often be stopped in self-doubt before picking up a new Batman comic because, as soon as they see or hear that Batman has been around for 78 years, a lot of questions can start crowding the mind. What do I need to read to understand this issue? Do I have to start with #1 from 1939? How often do they change things? WHAT DO I NEED TO KNOW?! The X-Men have been around since 1963 and their history is just as cloudy and problematic as any other book. What indie cartoonist, Ed Piskor, is doing with his limited series, X-Men: Grand Design, seems impossible. 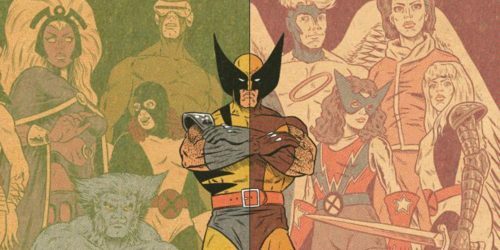 Taking the 54-year history of the X-Men, Piskor will try to have it all make sense over the course of six oversized issues. The simple truth about comics that have long lineages is that––no––you don’t have to read every single issue ever. 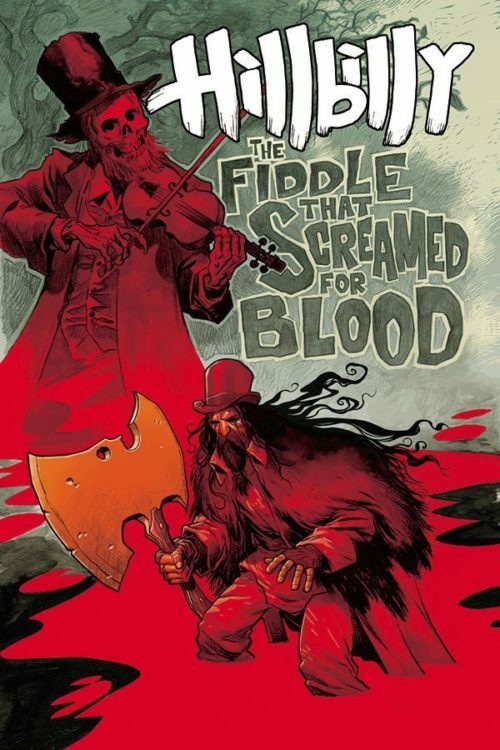 Even with the trend of telling about 6-issue serialized stories, go ahead and pick up the book in front of you. What matters is that you have fun instead of necessarily understanding everything. What happened before doesn’t matter, you’re smart enough to figure out what you need to know. These schisms in narrative have a wide variety of reasons, from editorial demands to shifts in culture to simply ignoring what came before. For some reason, thankfully, Piskor is going to find a through line through every main X-Men story and tie everything to it. Not that it can’t be done, but most of my interest in this book lies in the “how” of it over the indie cred he’s bringing to the X-Men, which is cool, too. And it (at least with my reading of Volume 1) really, really worked. I mentally filed issue #2 into my nebulous list of all-time favorite single issues of all comics ever. 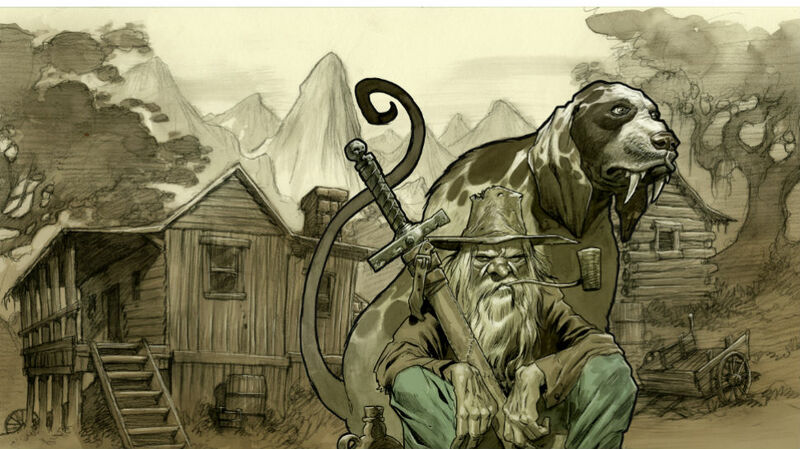 The comic is mysterious and episodic and seems, in a way, to suit Powell’s writing style even better than The Goon did. It caught me off-guard and, with this week’s release of Volume 2, I can’t wait to slog through that world again. I was a big Final Fantasy fan during the first leg of the series’ run, avidly and ravenously following the releases from its beginning on the Nintendo Entertainment System (NES) to its sixth installment on the Super Nintendo Entertainment System (SNES) (however, at the time, only three of the six games had ever made it to North American shores). After Final Fantasy VII was released on Sony’s Playstation, my interest began waning as new games and genres became more attractive to me. I fell off after Final Fantasy XII, but I always am interested in what happens with the series and privately hope that each game does well, even if I have no intention of playing it. All I knew about Final Fantasy XIV was that was the fourteenth game, duh, and that it was their second attempt at making an online-only game, specifically a Massively Multiplayer Online Role-Playing Game (MMORPG; I swear, that’s the acronym for those unfamiliar with this world) like World of Warcraft. Not only had my interest left the series by the time Final Fantasy XIV first released, but I never play games online, so I was doubly uninterested in this game. However, I am interested in good writing, criticism, and journalism about gaming and I was familiar with the mind behind the YouTube channel, Noclip, Danny O’Dwyer. An opinionated, brash, and thoughtful game critic, he split from a good corporate journalism gig to start a completely crowd-funded documentary YouTube channel about the gaming industry that would have the polish and journalistic veracity of any documentary made by a major studio. And, I must say, his promise been met with aplomb. He takes a look at the stories of the making of games big and small and, with “The Death & Rebirth of Final Fantasy XIV,” he gets about as big as you can get. He actually flew over to Japan and interviewed high-ranking people in the company that made the game, Square Enix, and the candor he was able to elicit from these executives and designers is almost unprecedented when it comes to Japanese game makers. In a nutshell, it’s a game that was originally released and completely failed. They took a risk, however, and while the game was still going online, completely made a brand new Final Fantasy XIV in the background and, when it was done, they torched the old one and imported all the players’ characters into the new one. What’s more is that they wrote in this into the story of the game as well. It resulted in becoming a very popular and well-received game, a tale of an expensive and risky turnaround that has never really been done before, in particular within the realm of MMORPGs. So, I watched a two-hour documentary (over three parts) about a game I have never played and have no interest in and I loved it. If anything, that speaks to the quality of the work O’Dwyer’s venture has been putting on to the internet for free. No drawing happened this week between grading and focusing on other work that I needed to get done before doing some traveling for the holidays. 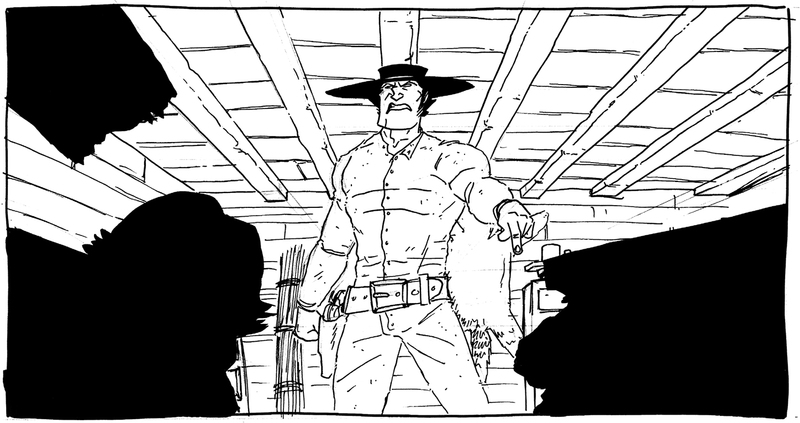 However, I do plan to jump back on the horse, so to speak, to get the rest of the pages drawn and scanned, at least, by the end of the winter break. Since next week is the last Friday before the new year, I’ll do something big for you then (specifically, cover and title reveal). This week, however, I’ll drop another panel from the beginning of the book. Long John reveals which direction the floor is. Again, I’m ready to jump into the details about the page when I should be saving that for the actual page notes. I will say that Chapter 3 really feels like an end to the first act of Long John. In all honesty, Chapter 3 would be more accurate if it were numbered Chapter 2, Part 2 as Chapter 2 ended in a cliffhanger and Chapter 3 picks up from right where we left off (which is why I’m not having any issue showing off artwork from early in the book––we know where it’s headed). This chapter will be the first major change for the character of Long John Walker, the first step to becoming a new person after everything was taken away from him (hence the tag line, right? “Losing Every Thing Changes Everything”) and is partially designed to have a structure mirroring Chapter 2. Like I said last week, I am incredibly proud of this chapter in a variety of ways, with writing and structure being a big part of it. I worried that Chapter 2 felt like such a tonal shift and doesn’t have the swagger that Chapter 1 had, but admittedly that was kind of the point. I feel Chapter 3 delivers on the setup of Chapter 2 while sewing together all three of the chapters so far into a nice complete package.